An effective and memorable advertising campaign can be both a blessing and a curse. On one hand, a phrase associated with your product will be forever embedded in your consumers' minds. On the other, they will probably find this mentally inextricable campaign to fall somewhere between mildly irritating and hair-tearingly unbearable. So to review, yes, they'll remember it, but they'll also grow to hate it. Sort of a mixed bag if I ever saw one. There must be something to be said for repetition. By my count, the old broad on the right croaks, "Where's the beef?" three times in a thirty second spot. No wonder we all remember it so well: they were essentially drilling it into our consciousness with these ads. The ad served to showcase the perceived poor ratio of bun-to-burger we find at most fast food restaurants. Not at Wendy's, though, according to our elderly spokesfriend Clara Peller. She's not sold on that all bun/mini burger combo and is quick to question the relative location of her cow byproducts, and with good reason. Nice going, Clara. You tell it like it is. "Where's the Beef?" became such a popular slogan that 1984 presidential candidate Walter Mondale actually adopted it for his campaign, accusing fellow Democrat-in-the-running Gary Hart of being all show and little substance. Admittedly, Mondale didn't ascend to the presidency either, but you have to admire his cajones for adopting a fast food slogan as a debate point. The Got Milk? ads are still circulating, but they premiered and reached their peak popularity in the 90s. Above is the first television spot in which an Aaron Burr fanatic fails to win the $10,000 radio call-in prize about, you guessed, it, Aaron Burr. And why, do you ask, were his noble Burr-loving efforts thwarted? Why, a peanut butter sandwich of course. With no milk to wash it down. All sandwich and no milk makes a very sad boy. Or at least one out $10,000. It seems the message here was fail to drink milk, miss out on valuable contest prize opportunities. You don't have to tell me twice. The ads featuring the trademark mustache ran in many popular magazines, showcasing milk mustachioed celebrities with a blurb about their calcium-rich lifetstyles. We'll just ignore that many of the young starlets featured in these ads went on to lead drug-addled, eating-disordered, generally troubled lives and chalk their resilience up to milk-related bone strength. This ad is proof that more irritating your ad, the more likely it is to catch on as a general societal phenomenon. These Budweisers commercials feature a group of beer-drinkin', football watchin' fellas greet each other on the phone with the phrase, "Whasssssup?" There was a certain inflection and accompanying head-shaking movement that made the phrase distinctive from its less idiotic counterpart, "What's Up?" The ad was actually based on a short film entitled True, which was basically the "Whassssup? "-loving premise we see here only with less direct product placement. That film caught the attention of someone over at Anheuser-Busch, and the rest was irritating catch phrase-spewing history. This ad was shown so often and parodied so frequently that it was quickly woven into the fabric of our daily speech patterns. I will admit, I did like the international version of the ad Budweiser put out. When that Japanese guy bellows, "Konichiwaaaaaaaaaaaaaa?" I just melt a little inside. There's nothing like good old fashioned animal ethnic stereotyping to bring something fresh and fun to the fast food advertising table. Thanks to Taco Bell, I can't imagine any of my friend's chihuahuas speaking in anything other than a Mexican accent. Granted, they don't really speak so much as yip, but I'd prefer to not feel guilty over my racial profiling-style translation of their yips into requests for cheesy gorditas. 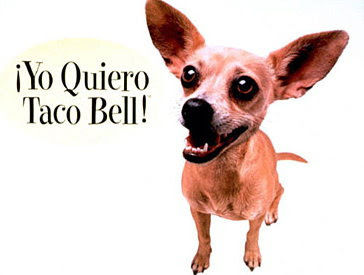 Taco Bell's chihuahua became a very popular advertising icon, and his trademark phrase, "Yo Quiero Taco Bell" quickly rose to catch phrase status. All this dog did was walk down the street, proclaim his desire for Taco Bell in Spanish, and everyone loved him. It seems the second you throw another language into the mix, the ad suddenly becomes exotic and interesting to the general public. I can't imagine we'd have reacted the same to a Staten Island Taco Bell Dog. In 1992, who didn't want to be like Mike? We were all in awe of the basketball star's incredible prowess on the courts, and if Gatorade promised to make us just a little more Mike-like, well, then we were going to take them at their word. I drank hundreds of Gatorades and have yet to make a jump shot. How do you explain that one, Gatorade? Huh? Though most of us 90s kids wouldn't know it from our own respective childhoods, the Energizer Bunny actually started as a parody of their battery-producing rival Duracell's trademark Duracell Bunny. I know, right? A Duracell bunny? Who knew? The popularity and resonance of Energizer's mascot far outlived its competition, and its Energizer Bunny soon became a highly recognizable character. I mean, he wears wayfarer sunglasses and plays a marching band-style drum. What's not to like? The people at Good Humor-Breyers just knew that we were all gaga for the rich chocolatey ice-creamy taste of their trademark Klondike Bars. So they posed us a simple question: What would you do for a Klondike Bar? According to their commercials, it seemed we'd do quite a bit. The ads were definitely memorable, but they also made me seriously question my candy-coated ice cream intervention. I'm still working on my 12 step program. I'm just about to apologize to my dog in the above ad for mocking him just to get my fix. Sorry, Fido. What exactly is this mysterious "it"? We may never know, but at least Nike dropped us all some helpful hints in the slogan's premiere ad spot in 1988. "It" must be some sort of athletic ball, though its exact specifications are never clarified. I guess we'll just have to keep buying Nike products till we find out. I have a feeling that Swoosh will eventually point us in the right direction, though I can't be sure. Yes, that's right: not only did this decade's advertising campaigns encourage us to embrace our addiction to Klondike Bars, we were supposed to take on the Pringle fix as well. I'm not exactly sure what all of these addiction-themed ads are trying to tell us about the relationship between advertising and susceptibility to addiction, but I don't think I want to know. I can't even look at a duck anymore without picturing myself in full on Pringle duck-bill mode. That's how far this has gone. Are you happy now, Pringles? Well? Are you? When I think class and upper crustiness, the first place my mind usually goes is mustard. I can't help it. I know they must eat caviar and filet mignon also, but my childhood advertising never exposed that side of wealthy living to me. No, all I got was the Grey Poupon angle. Apparently, if you're classy and you drive a Rolls Royce, people are bound to trouble you for some Grey Poupon so you sure as hell better have some on hand. I mean, can you imagine the humiliation if another Rolls pulls up alongside yours and you don't even have any mustard to offer? For shame. Okay, okay. I admit it. This one is such an easy target. It just oozes a corniness and poor reenactment quality that rivals any grainy black and white fake footage I've seen in those Discovery documentaries about unknowing pregnancies. And let me tell you, that's no easy feat. Despite the fact that our narrator informs us that she was allegedly "deathly ill", she still summoned the mental wherewithal to press her LifeAlert button. Now that's a powerful system. Death doesn't stand a chance against it. Whether it's Mr. Miller's poorly acted chest pains or Mrs. Fletcher's trademark falling/inability to get up, this commercial was really asking to be mocked. If you're trying to convince children to respect the elderly, I'd advise never showing them this commercial. Even after the laughter eventually dies down, they're doomed to forever think of the old as both helpless and in desperate need of acting classes. Not exactly the respectable combination they may have hoped for. Whether or not you'd like to admit it at this juncture in your life, most of us shamelessly repeated these refrains as if we'd discovered the golden ticket to comedic exceptionality. At one point or another, you probably pretended to be a Rolls Royce patron in desperate need of spiced mustard or a Chihuahua seeking his favored cheesy sour cream chalupas. It's time to embrace your embarrassing youthful slogan parroting and remember these campaigns for what they were: brilliant forays into the realm of eternal memory. Someday we may be old and senile, but we will probably still quip from our adjustable hospital beds about the addictive qualities of Pringles or the basketball skill-affirming powers of Gatorade. Now that's good advertising. This is a really great post, wow!!! I remember some of these ads, LOL!!!! What about the Kit Kat theme song? Not really around that much anymore, but still fun to sing along to. What would I do for a Klondike bar? I'd go out to the store and buy some. I sort of miss those slogans. It seems like nothing has really caught on in recent years. Thanks for the lovely comment I truly enjoy it when someone takes the time to do so!! Also the dog who played the Yo Quiero dog died recently. :( Drag. And it may be gratuitous but help I've fallen will never get old. Never! Loved this whole post. I still work some of these into my daily routine of speech. Oh boy. Cute post, it made me smile! In Europe, the Duracell Bunny is still used for advertising! In the US, Duracell accidentally let the trademark on the bunny lapse and Energizer seized the opportunity meaning Duracell couldn't use it any more in the USA. But Energizer don't exist in Europe, so the bunny lives on over there! Influence can be defined as the power exerted over the minds and behavior of others. A power that can affect, persuade and cause changes to someone or something. In order to influence people, you first need to discover what is already influencing them. What makes them tick? What do they care about? We need some leverage to work with when we’re trying to change how people think and behave. Enthusiastic beginning is very common in every sector when anyone enters into a new world. But it is very hard to keep such enthusiasm for a long time after huddles come out from invited sources. Read this blog and know more about this topic. Bannerizer made it easy for you to promote ClickBank products by banners, simply go to Bannerizer, and get the banner codes for your selected ClickBank products or use the Universal ClickBank Banner Rotator Tool to promote all of the available ClickBank products. Check out the 90s Forums! Save on Brochure and Postcard with Online Printing company UPrinting.com! Contact Children of the 90s! Let the Glamour Shots Challenge Begin! All images on this site are intended for illustrative purposes and are not intended for commercial use or financial gain. The image content on this page is used solely for personal, educational and noncommercial purposes for fair use as defined in the United States copyright laws.